This project of ours was completed in 2009 and is still one of our favorites! Photo by Chip Pankey. If you follow style trends you know the routine: concepts enter the scene, there are early adopters, and over time they become mainstream. Soon anyone who is building, remodeling, or decorating is selecting similar items (after all, it's the products and colors being offered by all the vendors!). Recently I've noticed the curve is even more aggressive. Social media propagates style tendencies at a fast and furious pace. As a designer, I see trends early and I tire of them fast. For this reason, I am on a mission to provide timeless design; to find unique solutions that feel current, but also elevated. There is no off-the-shelf recipe for how to accomplish this. If there were it would be achieved more frequently. It's a skill that separates great design from good design. It's a subtlety recognized by mature design lovers and achieved by only the most talented. It's a quality that is not easily described with words, but when it's right, you just know it. 1.Take your time. Ever bought a whole room all at once? Yah, me too – in college. It's a surefire way to a one-dimensional space, and you’ll tire of it fast. The idea is propagated by stores like Rooms to Go and IKEA, who advertise ‘easy design’. Don't get me wrong – these stores have their market. They simplify the process of buying furniture for people who want to get it over with fast or economically, but this is not a path to an elevated space. Fine design is curated and takes time. 2. Incorporate one or two unique pieces. Include something special that speaks to you, like an old family chair, or an antique rug or mirror. Yes – even in a contemporary space. You just have to go about it carefully and selectively. Doing so will add richness and keep it personal and interesting. It’s a direct expression of you and your family, and no one else will have your exact solution. This antique rug in our Spicewood Contemporary project adds warmth and character in an otherwise stark white kitchen. Photo by An Indoor Lady. 3. Selectively Splurge. 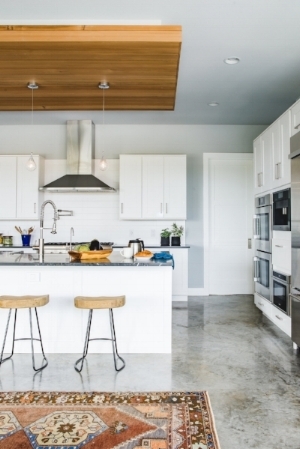 Whether you are building, remodeling, or just refining your home over time, choose an area to stretch your budget and introduce a high-end element. It can be a lamp, a sculpture, anything. I have a thing for tile, and when remodeling our kitchen awhile back I fell in love with a beautiful backsplash tile from Walker Zanger. It seemed like a hefty price tag at the time, but I only needed 18 sqft.! And the results were well worth it. Now it adds a special touch to our kitchen, and each morning when I’m sipping my coffee it makes me smile. Priceless! This is my Walker Zanger backsplash. I love it so much! Photo by An Indoor Lady. 4. Learn from history. In particular I like to look back to classic interiors from design icons, furniture designers, and legendary architects. Here’s an example: recently I was discussing the use of marble and brass with a client. She said to me "I think of the federal buildings - if it was good enough for past presidents it is good enough for me!". Shortly after that I was in D.C. and paid special attention to the details in those buildings. She was right! Materials and finishes will go through cycles of popularity, but if a strategy has been used for many years it is likely a timeless one. Finding inspiration from historically good design is a way to avoid short term trends. 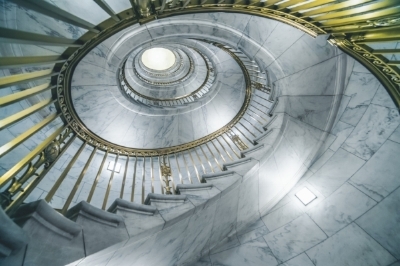 This marble and brass staircase in the Supreme Court Building is a stunning example of timeless design. Photo courtesy of Getty Images. 5. Faux is just that : false. Ever seen something fake that you liked as good as the original? Me neither. Good design is real and purposeful, and it doesn’t have to pretend to be something it’s not. The “architecture snob” in me comes out when I see a column supporting nothing, or a painted sheetrock wall pretending to be plaster. Please don’t do it! I had an old friend from architecture school who would cringe at this stuff. He would joke about fake shutters tacked on suburban homes, and corbels that were purely for decoration. Whenever I comment on such things my husband says “you sound like Andy”, and I say “well… he was right”. 6. Nature never goes out of style - incorporating natural textures such as wood and stone adds richness to an interior. For a timeless approach, try finding slabs and materials that are less commonly used. Also, anywhere a view can be appreciated - play that up. A touch of nature elevates any space. These slabs of Red Onyx, used by architect Mies Van Der Rohe in the Barcelona Pavilion in 1929, are a gorgeous example of nature in design. 7. If everyone has it maybe you shouldn't. Enough said. 8. A little goes a long way when it comes to color. The color fad cycle is even tighter than that of materials, finishes, and furniture. I’ll admit that if you look at our LBI interiors you might conclude we’re pretty neutral. It’s not out of fear to be bold – it’s an awareness that in pursuit of timeless design it’s a decision you’ll regret faster than any other. Tile, cabinets, expensive furnishings – these features have a cost attached that make them less inclined to be swapped out often, so you’d better like them for the long haul. Paint, pillows, art – these are much easier to change, and for that reason I am more inclined to embrace color in these areas. 9. Most importantly - choose things because YOU love them, not because they are in style. Let's remember that the ultimate goal of "timelessness" is having a home you will love for years to come. If you stay true to who you are, then your choices will continue to reflect your personality regardless of what everyone else is doing. In summary, style trends will come and go. When it comes to your home, pursue quality first, then lean toward personal expression rather than popular fads for an interior that will stand the test of time. Engineered – this is indeed REAL wood – NOT laminate (a common misperception). Engineered is one of the most durable and stable kinds of wood floors, and it’s what I use most. It has a solid natural wood layer on top (called the “wear layer”) and it comes in different species, thicknesses, etc. Engineered wood is constructed with criss-crossed sub layers of plywood below that give it stability to prevent expansion and contraction with changes in humidity. Solid Wood – this is what you’ll find in old homes in central Austin and elsewhere, and that’s what people like about it. This isn’t as easy to use in a remodel because it’s thicker and less likely to work for transitions to other materials. It is also more prone to warping, cracking, etc. than an engineered wood, although sanding and refinishing is easier than with other materials. The cost of wood floors varies greatly by type and then by manufacturer and species. Generally speaking, in Texas you can usually get quality wood floors, either engineered or solid hardwood, for anywhere between $10 - $20 per square foot installed. The cost of vinyl planks is about half of that, and tile falls somewhere between the two. A prefinished product is quick, easy to install, and a bit more “predictable” in color if you find one you like. It is ready-made and factory finished and technicians can install it within a day or two. I recommend buying an extra box so that if planks get damaged they can be replaced. This flooring is not really one you can sand and refinish easily (you can with some choices, but don’t assume that without asking first!). Unfinished flooring takes a little more time. The planks are laid, stain samples are made, and then the entire floor is stained and finished. These floors are easier to sand and refinish down the road if issues arise, but they also tend to be a little more expensive, and it takes time to work out the “perfect stain color”. Clients of mine who choose this method like the fact that the end result feels a bit more like “natural wood” and less like a manufactured product than pre-finished material. There are a few different methods of installing engineered wood floors. Click locking engineered planks have special tongue and groove systems that simply lock together. They don’t involve glue during installation and just lay over a foam or cork underlayment. Glue down floors glue directly to the concrete subfloor. There are benefits and drawbacks of each, so without spending too much time on this topic I recommend you talk to a flooring expert to understand the trade-offs for your specific situation. We all know that real wood is not a friend to water. Exposure to moisture is the primary cause of damage to wood floors. Having said that, clients are using wood more often these days in kitchens, utility rooms, and powder baths without a problem. Methods of waxing and sealing have improved, but no real wood floor is going to hold up to prolonged water exposure such as that from a flood or a busted pipe. Many clients who love wood are willing to take that risk, knowing that if an incident occurs they’ll have to replace some amount of flooring. On the other hand, if you know in advance that your floor is in a high traffic area and prone to standing water, but you really like the look of wood, it’s a perfect opportunity for vinyl planks or tile made to look like wood. Maple – reddish brown or yellowish tan. Typically lighter grain. Oak – often white, honey, or reddish. Can be heavy grain, or rift cut offers a linear grain that’s nice in contemporary design. I use this often. Walnut – dark chocolate brown. Usually lots of variation and flowing grain. I use this in both contemporary and traditional interiors. Hickory – light or reddish brown. Often has knots and distressing. I use this in more rustic environments. Acacia – deep brown with LOTS of variation! I have used this in both contemporary and traditional environments. It’s best for someone who appreciates movement and color variation. For a floor that is less slippery, choose a textured surface. There are slip-resistant hardwoods that can prevent falls and are especially valuable for senior citizens. Other than that you’ll see floors that are hand-scraped, which tends to be a traditional or rustic strategy, or those that are smooth, which is what I lean toward in contemporary design. Pay attention to whether the finish is glossy versus matte. These considerations are primarily personal preference, but your designer and/ or flooring expert can provide guidance on what’s best for your specific situation. Hope this has been helpful. In the meantime... best of luck on your flooring journey, and a big thank you to Jessica Kane, a writer for GoHardwood, who collaborated with me on this article. We all know someone with a 'bad contractor' story. Or you see it on TV: some guy partially completed a job and then skipped town. Sure every industry has a few "bad seeds", but quite honestly I think contractors get a bad rap. After years in the industry I’ve worked with dozens of contractors across the country who have been honest, fair, and caring about client satisfaction. On a personal level, my husband is a builder, I have managed remodels, and I work hand in hand with contractors daily. Based on these experiences I've developed some first hand opinions on how to successfully work with building professionals. Follow these tips and I guarantee you'll have good results too! 1. Get referrals from sources you trust. 2. Interview a few of them on the phone. Are they easy to communicate with? Do they sound experienced and professional? 3. Set up appointments with your top two or three. 4. During the appointment, ask questions about their process. Most experienced professionals have developed a process that works for them, and if you hire them it's best to work within those parameters. 5. Ask about their preferred vendors. Does your Uncle Bob have a lighting store and you hope to buy from him? Getting their input on this in advance will avoid awkward discussions later and allow you to consider this in your decision. 6. Proceed with getting bids, but again only from two or three (more than that is needless and overwhelming!). Many of them will offer to do a high-level estimate rather than a detailed exercise with visits from their tradesmen. That's totally fine. They often have enough experience to draw reasonable conclusions about your project without bringing everyone over. If you prefer a detailed estimate many good GC's will provide that for a nominal fee. I've had clients balk at that, but in my mind it's totally fair on large and involved projects. 7. Provide a detailed Scope of Work and drawings if appropriate (I often develop these documents for clients). The bids can only be as accurate as the information you provide, so make sure you have clearly defined the scope and that you are offering enough detail to receive apples to apples information. I typically include preset allowances for things like plumbing and electrical fixtures to reduce the number of variables and indicate expected product quality. 8. Once you've reviewed the bids and made a decision, close the loop with everyone on your decision. They put a lot of time into the estimate and it is the polite thing to do. 1. Be flexible. Don’t try to tightly squeeze a project in before a big family holiday or party. Challenges will come up and you want to make decisions based on “doing it right” rather than forcing something to meet a deadline. 2. Provide information in advance. Product orders need to be placed, so understand lead times for your selections and plan appropriately. Avoid stress by thinking through each detail that the tradesmen will need. For example: you know you want sconces on both sides of the mirror – how wide is the mirror? Do you know where the center line is for the faucet? How tall are the sconces and where is the junction box on the fixture? Label the exact height and placement on the wall or on a drawing (this is a service I provide for my clients). Clear communication is the best way to avoid surprises, disappointment, and expensive re-work. 3. Be available for questions, and ask the contractor his preferred method of communication if an issue arises. Do they prefer email or text? Are they early risers? Do they typically work on weekends? Most contractors work long hours - be respectful that they try to carve out time for their family too, and just because you are thinking about your project at that moment doesn’t mean they should be (can you tell I’m speaking as a wife as well as an industry professional?). I have a few sweet clients who send emails on the weekend with the title “Don’t Read Until Monday”. They get it. 4. Find periodic times to walk through and get your eyes on things to make sure obvious mistakes are caught (the wrong tile or paint color is going up, etc.). There is a lot of detailed communication involved and honest mistakes can happen. If you approach the discussion in a way that’s not accusing, and contact them in the way they prefer, good contractors will work with you toward fair resolution. 5. Regarding money – keep in mind there are expenses with your project and make sure you provide them what they need to stay ahead of things. In the same way you don’t want them to run off with your money – it’s not fair for them to be your bank. Understand in advance their terms and be prompt with payments. It won’t go unappreciated. 6. Another tip on the topic of money - understand that the contractor is in business to make a profit, and it’s fair for him to do so on your project. I’ve seen clients who are so determined to get a “deal” on things that they squeeze every ounce of profit out of the project to the point of taking advantage of the contractor. For example with a “cost plus” model I’ve seen clients ask to not pay the percentage on high cost items such as appliances. Okay, I understand, but how many trips did he make to your house to fix that light switch that was malfunctioning? And did he make any profit on the switch? It works both ways and usually balances out. If the appliances are going in during the project he's having to coordinate delivery, wire and plumb for them, protect them after delivery, etc.. Everything requires coordination, and at a certain point if your project is not profitable for him, he won’t enjoy being there and you won’t get his best work. The bottom line is – do your homework and treat others how you wish to be treated. I am in no way suggesting you won’t encounter frustrations (issues arise with every job – there are many moving parts! ), but if you follow these guidelines it will work out best for you in the end! Laura Burton is dedicated to creating beautiful, sustainable, and functional spaces for residential and commercial clients nationwide.